This topic describes the syntax of lambda expressions. It provides an example that demonstrates the structural elements of a lambda expression and how these elements relate to the example. The following program uses lambda expressions with two STL algorithms: generate_n and for_each. The lambda expression that appears in the call to the generate_n function assigns an element of a vector object to the sum of the previous two elements. The lambda expression that appears in the call to the for_each function prints an element of the same vector object to the console. // Print the contents of the vector. For more information about the generate_n function, see generate_n. For more information about the for_each function, see for_each. The following sections describe the grammar of a lambda expression and how each element relates to the preceding example. The following section describes how the grammar relates to the example in the introduction. The following illustration maps the grammar to the example. The following sections describe the grammar in more detail. A lambda expression can access any variable that has automatic storage duration and that can be accessed in the enclosing scope. The capture clause specifies whether the body of the lambda expression accesses variables in the enclosing scope by value or by reference: variables that have the ampersand (&) prefix are accessed by reference and variables that do not have the & prefix are accessed by value. The empty capture clause, , indicates that the body of the lambda expression accesses no variables in the enclosing scope. You can use lambda expressions in the body of a class method. Pass the this pointer to the capture clause to provide access to the methods and data members of the enclosing class. For an example of how to use lambda expression with class methods, see Example: Using a Lambda Expression in a Method in the topic Examples of Lambda Expressions. The parameter list cannot have default arguments. The parameter list cannot have a variable-length argument list. The parameter list cannot have unnamed parameters. A lambda expression can take another lambda expression as its argument. For more information, see Higher-Order Lambda Expressions in the topic Examples of Lambda Expressions. The mutable specification part enables the body of a lambda expression to modify variables that are captured by value. The preceding example uses the mutable keyword so that the body of the lambda expression can modify its copies of the external variables x and y, which the lambda expression captures by value. Because the lambda expression captures the variables x and y by value, their values remain 1 after the call to generate_n. For more information about exception specifications, see Exception Specifications. 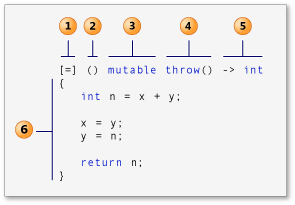 The return type part of a lambda expression resembles the return type part of an ordinary method or function. However, the return type follows the parameter list and you must include -> before the return type. You can omit the return type part of a lambda expression if the lambda body contains a single return statement or the lambda expression does not return a value. If the lambda body consists of a single return statement, the compiler deduces the return type from the type of the return expression. Otherwise the compiler deduces the return type to be void. A lambda expression can produce another lambda expression as its return value. For more information, see Higher-Order Lambda Expressions in the topic Examples of Lambda Expressions. In addition, a lambda expression can access variables that it captures from the enclosing scope. A variable is explicitly captured if it appears in the capture clause of the lambda expression. Otherwise, the variable is implicitly captured. The body of the lambda expression uses the default capture mode to access variables that are implicitly captured. Because the variable n is captured by value, its value remains 0 after the call to the lambda expression. For more information about the generate function, see generate.